Presidents vs Terrorists is a game where you play the world leader. The world leaders in the game are trying to get rid of the terrorists of the world, and you are just hoping that you can get rid of them somehow. This means that have to have no mercy as you fight, and you need to be the first person to get rid of the terrorists. This is a game where you are going on the hunt for people who are not doing right, and you will continue to hunt them until there are none of them left. In real live this could take some time as you search for them, but there are out there waiting to be cut. Think of all the different kinds of terrorists there have been over the years, and imagine that they are all doing the worst acts possible at one time. You will see someone blow up a cafe in Paris, and you must go after them to see if you can catch up with them. The terrorists who have been in fighting against you must beware if they run into you because they will be caught at once. You will investigate everything you see happen in this game, and you will use the information you find to get them to justice. Some of the terrorists are going to die because you had to kill, but others of them will get caught in the act of doing something new. You get to decide if you kill them or arrest them, and you have to keep up with them. These terrorists can kill hundreds of people at a time, and they will keep doing so until you have caught them all. 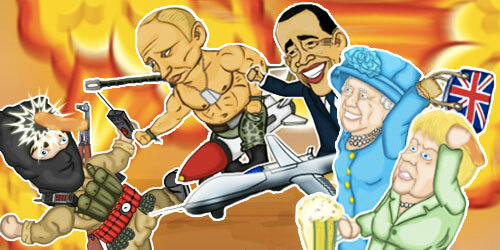 Presidents vs Terrorists is a game that forces you to use your strategy and wit to fight crime. The terrorists are going to try to outwit you and prove that they are smarter than you, but you can show them that you can catch them. This is a cat and mouse game that you have to keep playing until one of you loses. The terrorists could catch you by surprise when they actually assassinate you, or the game will end because you were able to catch all the different terrorists around the world who are not doing right. These people have to be brought to justice using your wisdom as they are chased across the globe. Let’s see how far you can kick: Presidents vs Terrorists! Pingback: Presidents vs Terrorists: A timely game about chasing out terrorists with a touch of parody | We Are Super! Pingback: Presidents vs. Terrorists – Ein humoristischer Pausenknüller voller verbündeter Lacher | Spiele Online!